How Do I Send Photos In Messages On My iPhone? Find The Camera! You are at:Home»iPhone»Messages»How Do I Send Photos In Messages On My iPhone? Find The Missing Camera! How Do I Send Photos In Messages On My iPhone? Find The Missing Camera! You just updated your iPhone and you want to send a photo to your friend. You launch the Messages app, open your conversation, but you’re surprised to discover that the camera button is missing! Don’t panic. 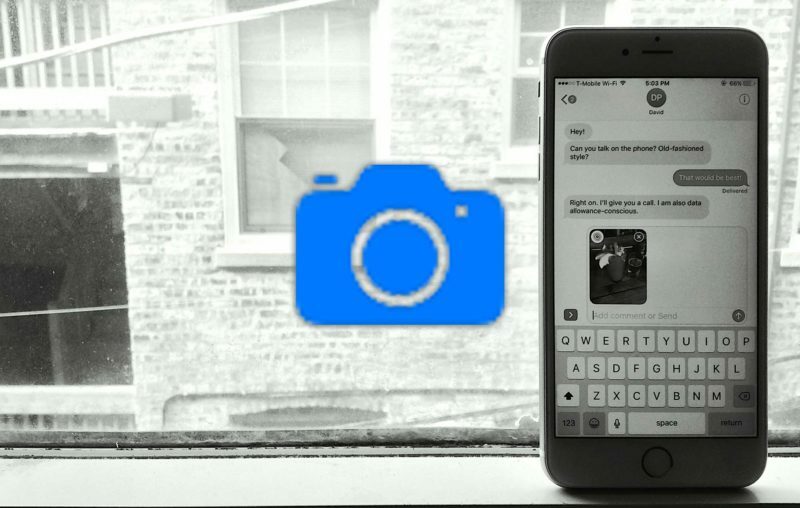 In this tutorial, I’m going to show you how to send photos in the new Messages app on your iPhone and how to find the “missing” camera button. My Camera Button Is Missing! Don’t worry — it’s not missing! Apple moved the Camera button when they updated the Messages app in iOS 10. Where Is The Camera Button In Messages On My iPhone? 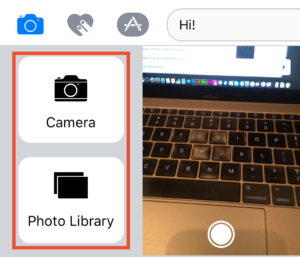 To find the missing camera button in the new iPhone Messages app, tap the gray arrow on the left side of the text box and three buttons will appear. Tap the camera button to take or send a picture. How Does I Send Photos In The New Messages App On My iPhone? The camera button is — you guessed it — how you send photos in the new Messages app. When you tap on the button, your keyboard will transform into a neatly laid out version of your Camera Roll. You can use your finger to swipe left and right to scroll through your photos. On the far left-hand side of the photos menu, you’ll see a live view of your camera. You can switch to the front facing camera by tapping the camera button at the upper right corner of the view and you can snap a photo by tapping the shutter button at the bottom of the live view. When you snap a photo, it will automatically be added to the text field (but won’t send without you pressing the send button). How Do I Take Full Screen Photos In The Messages App On My iPhone? First, tap the gray arrow on the right side of the text field, and then tap the Camera button to bring up all your photos. Swipe from left to right to reveal the Camera button, and then tap the button to take a full screen photo inside the Messages app. 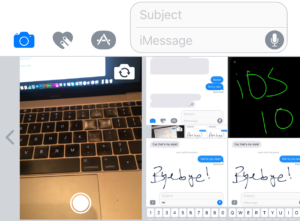 How Do I See All My Photos In The Messages App On My iPhone? Tap the gray arrow on the left side of the text box. Tap the Camera button to open the Photos view. Swipe from left to right on top of your photos to reveal the Photo Library button. Tap Photo Library to see all of your photos. As you can see, sending photos from your iPhone in the new iOS 10 Messages app is easy, once you get the hang of it! Stay tuned to PayetteForward for more iOS tips and tricks. I hope this article helped you out, and I’d like to hear your thoughts in the comments section below. Previous ArticleHow Do I Use Bedtime In The Clock App On My iPhone? The Guide. Next Article How Do I Send Drawings, Disappearing Messages, And Hearts On My iPhone? Digital Touch! I'm Andrew Kunesh, a technology writer and IT professional from Chicago. My goal is to help you fix the many errors and problems your Apple devices may face. Thanks for checking out our work!